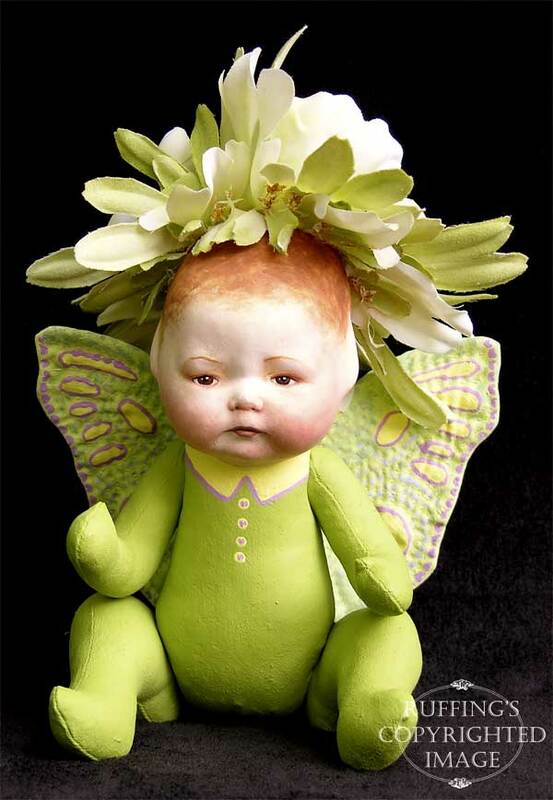 “Greta”, my new chrysanthemum flower baby fairy is finished! She has an antique reproduction baby face of papier mâché. Her head and pointed ears are paperclay, and her body is 100% cotton cloth. Her pale green butterfly wings with yellow spots are hand quilted and she is entirely hand painted with acrylic paint. She will be sealed with matte varnish for protection. She has hidden button joints which make her posable, just like “Rosa” who left for her new home at the beginning of this week. I managed to get a few pictures of them together before she left on her journey. Greta has an oak-colored stand that lifts her in the air so she can practice flying, and running through the air. She enjoys that. Update: Greta and Rosa have been adopted. Thank you! 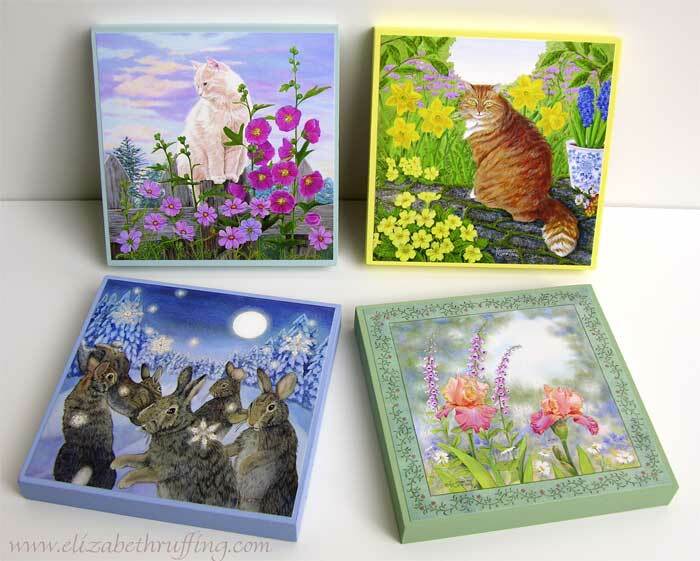 I’m also introducing some mini art plaques. I’ve painted 6 by 6 inch solid poplar wood to coordinate with my artwork and mounted several reproductions of my original watercolors on them. 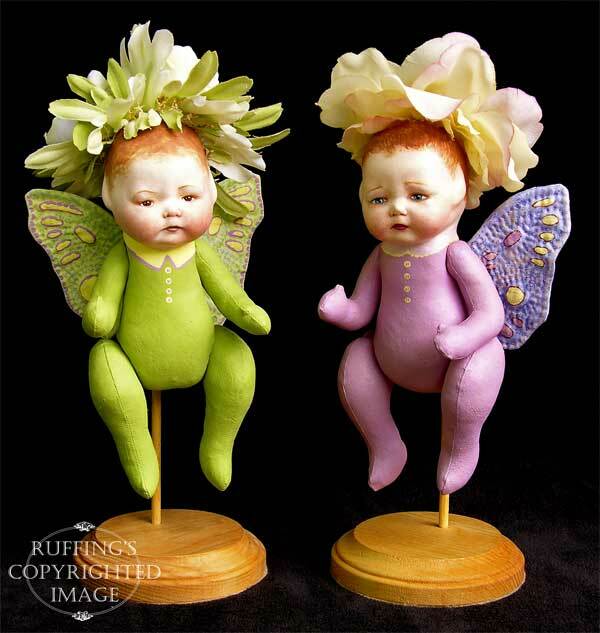 Above are “The Fairy and the Dove” and “Fairies and Butterflies“. Clockwise from the upper left these are “The Guardian“, “Laurence with Primroses and Daffodils“, “Iris and Foxgloves“, and “The Rabbit Dances“. They are all made using archival grade materials and I will be varnishing them for further protection. Prints of these images are available on our website. 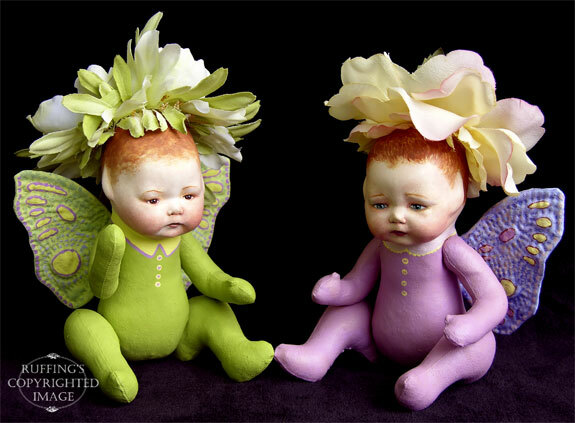 the baby fairies are adorable!